Leading Edge is the top fenestration coil supplier in the insulated glass industry. Our product and equipment know-how, unfailing customer support, personalized service, and overall quality is unmatched by the competition. We have developed, improved, or refined all steel, stainless steel, and aluminum products for GED’s systems. Furthermore, Leading Edge is an approved supplier for all GED equipment with regard to consumable coil products. Since 1995, our track record with GED speaks for itself in terms of quality and products. Our products are produced according to the fenestration industry’s strictest manufacturing standards using only the absolute best materials with no overruns or compromised quality. In fact, we guarantee the quality of our products, ensuring for our customers an experience that guarantees results. Leading Edge evolved two decades ago as the preferred supplier to GED machinery to an international supplier of materials for the window industry. Over the years, we have expanded our operations and product offerings with the same dedication to providing the best products at competitive prices. Our commitment and focus to the fenestration industry ensures that we will remain innovative. Leading Edge works closely with manufacturers of IG and roll forming machinery to continually develop new materials that reduce machinery wear, increase productivity, and ultimately lower costs. Moreover Leading Edge, through rigorous design and development, has introduced several products including EdgeStar Stainless Intercept, Blackline Warm Edge Intercept, TinPlateLite® , and .0078 ThinStar Tin Plate, together with interchangeable manufacturing capabilities with EdgeStar Stainless. Today, hundreds of window manufacturing companies across North America rely on Leading Edge. From our home office in Ohio, we expedite the ordering, packaging, shipping, and distribution of only the highest quality products through our six distribution centers across the United States. Flex Powder Coating is an Atlanta-based powder coating company with a reputation for quality work and an in-depth understanding of the industry. Similarly, FlexScreen Atlanta manufactures the world’s first flexible window screen. With its simple design, this damage resistant product is installed effortlessly and drastically improves the site lines within the window’s profile while eliminating the need for color matching. Leading Edge is committed to bringing you the materials you need fast and on time. 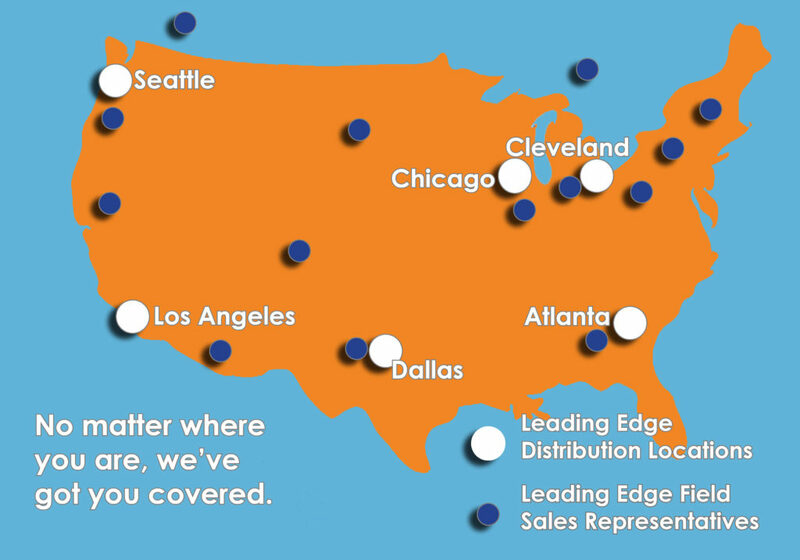 Our six US locations serve all of North America with true Just-In-Time inventory management. Because of our wide reach, we offer lower transit times and unparalleled savings. We know how costly it is to maintain a large inventory, yet no one can afford to run out of product. That’s why Leading Edge works with you to determine your inventory requirements and develops a customized JIT program to fit your unique needs. Our sales force consists of over a dozen experts in the fenestration industry who are trained in roll forming processes, industry standards, and machine and material auditing. We have field sales representatives based throughout every region of the United States, including Canada. Leading Edge has you covered, wherever you are or wherever you’re going.